Analysis: The creativity of mourning families never ceases to amaze me. The solar powered lamp is a true stroke of genius! 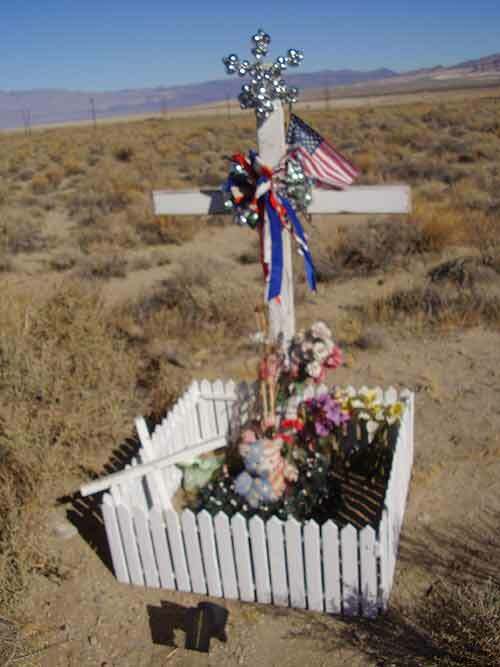 Unlike all other white crosses I've seen, this monument shines proudly for motorists to admire through the night. The roadside tribute itself is strangely anonymous. There are no names of dates on the cross, and the only telling feature is the depressing "#1 Dad" medallion. As for the accident itself, this road is notoriously boring so I imagine "#1 Dad" fell asleep at the wheel and ran his car off the road. Either that, or a local drunk from Olancha took him out. Whatever the case, kudos to the family for their awesome memorial.